In the year of 1970, the musical world was going through major adjustments. Civil Rights had finally made its way through and black artists were being recognized in the mainstream music scene. Labels, such as Motown, made this push possible. The Supremes had emerged as one of the top African American mainstream acts. They had tremendous success with unforgettable, chart toping tunes including “Where Did Our Love Go,” “Stop! In the Name of Love,” and “Baby Love.” As one of their last albums was titled, they were the cream of the crop. By 1970 it was time for a change and that included The Supremes lineup. Diana Ross had emerged a star and Motown owner and founder, Berry Gordy, saw this. Many accredit this to their once love affair, but her continued and proven success over the last forty years proves that Miss Ross had superstar chops. It was time for Diana to be placed outside of her comfort zone and become a solo act. 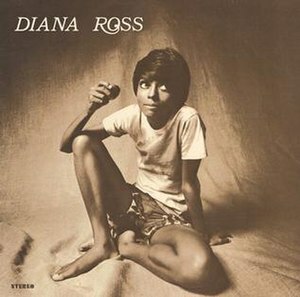 Diana Ross proceeded to record an album with some familiar tracks on her own. She worked with famed producers and artists, Ashford and Simpson, and she confidently recorded her first solo album. This album produced two of Ross’ signature hits, “Reach Out and Touch (Somebody’s Hand)” and “Ain’t No Mountain High Enough,” but there is much more to this album. I listened to this album years ago while cleaning my house thinking nothing of the other songs. They only served as background noise. Once I actually sat down and listened to this album I realized I was extremely wrong. This album is jam packed with amazing songs. First, there is “Keep An Eye.” Ross had recorded this song before with The Supremes on the “Love Child” album, but there is a different feeling in her solo rendition. She hauntingly sings of how you should “keep an eye on your close friends” for a “friend is an enemy you can see.” The song goes on to explain how her friend stole her man, just because she loved him as much as she did. This proves fault on two sides and declares one victim. By the end of the song Ross explains how there used to be three of them, but now there’s only two. She urges listeners to guess who’s missing. Could this have been a situation that she perceived during her Supremes tenure? Ross has often spoke and written about her relationship with Barry Gordy. She claims he was very controlling, yet she often knew he had her best interests in mind. Could this have been a song for Mr. Gordy? These are just two tracks that typify the depth of this album. Some of Ross’ best vocals can be found on this record. One can feel the freedom in her singing style. She no longer had weights to hold her down, she now gained full responsibility for all her actions. This was Diana Ross, the beginning of a legend. Today, Ross still tours with her plethora of hits that she acquired through her solo recordings. I have been privileged to have seen her 3 times in concert and she is still a force to be reckoned with. Her first album is the prelude to everything Ross would become, both emotionally and musically. She proved there ain’t no valley high or low to keep us from hearing her tunes.